Eurovudas Typ 44/68 Log Cabin: The Eurovudas Typ 44/68 Log Cabin is a very spacious multi-room log cabin, which offers lots of natural light and ventilation for its interior, and a generous veranda with canopy at the front. The cabin can be constructed from either 44mm double interlocking tongue and groove boards, or 68mm triple interlocking tongue and groove boards. The interlocking nature of these wall logs means that draughts and rainwater are much less likely to penetrate between the logs, and the thickness of the walls themselves improves heat retention and sound proofing. All windows and the large windowed double doors are double glazed, with double rubber gasket for added protection from the elements. The veranda is supported by attractive 26mm terrace boards, also tongue and groove, and the canopy and roof itself are 19mm thick tongue and groove boards. 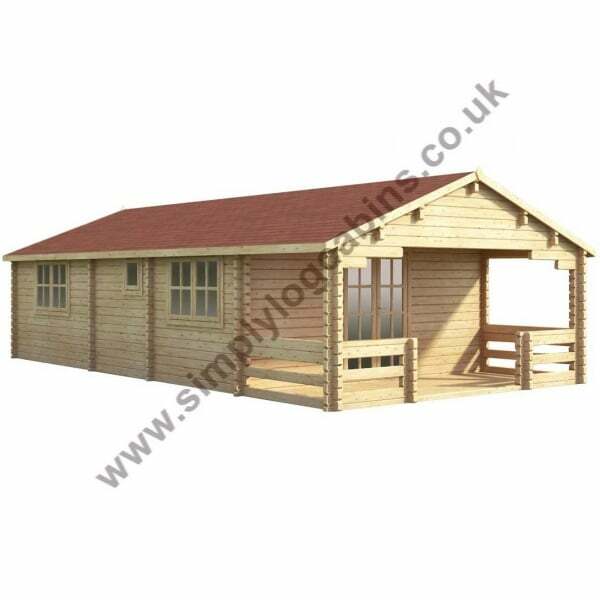 The roof can be further weatherproofed with the optional shed felt roofing and bitumen shingles, which Simply Log Cabins recommends for keeping your cabin protected for many years to come.